Anything strange about this photo? Yeah, I mounted a Nikon lens on the Samsung NX100 camera! 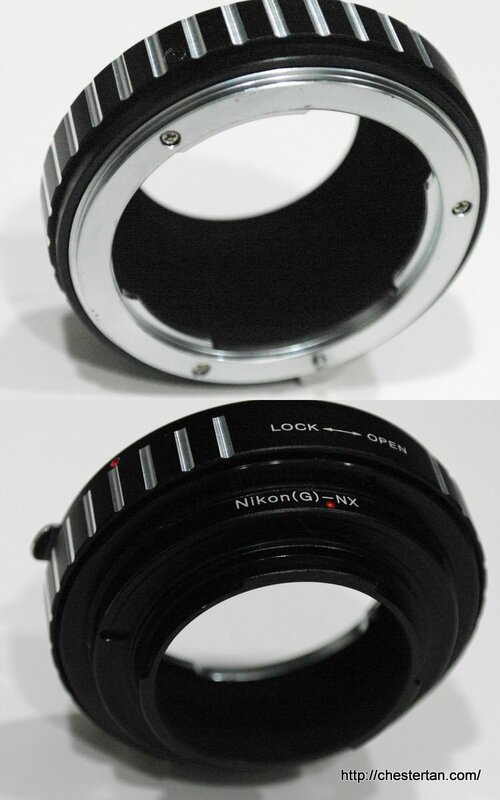 One ring to make it happen: the Nikon G AF-S Lens to Samsung NX adapter! This adapter is in the market for less than a year, because I tried to search for this adapter about a year ago without success. The Nikon AI-S adapter is around then but since many of my lenses are G-type lenses, I needed an adapter that can open the aperture. Operating Instruction: Mount the adapter between the camera body and the lens, switch the camera mode dial to M, twist the adapter ring to open up the aperture ring and adjust the shutter on the camera to your liking. Make sure “Framing Mode” is “Off” so that the live view shows the exposure. And focus manually. On the NX100, you may have problems handling with large or heavy lenses. Without a proper grip, it’s a struggle operating between the zoom ring and focusing ring. Focusing on small objects without AF assist can be a challenge, for instance when shooting wide angle. You could also adjust the aperture ring to achieve depth of field but there are no indications on the aperture value. I probably will not shoot with the adapter that regularly, but it’s a fun accessory to get, knowing that there is a chance of using lenses interchangeably when needed. At time of posting, this adapter is easily available on eBay. I bought it for US$37.99 including shipping. If your camera body is not Samsung NX, there are also adapters for Sony NEX and Lumix mounts. If your lens is not Nikon, there are also adapters for other brands.